Home Blog What Does Mary Look Like? What Does Mary Look Like? Have you ever wondered what the Blessed Mother really looks like? Folks have wondered about that through the centuries, and artists have contemplated how best to depict her. According to Scripture, she was completely Jewish, which means she would have had features and skin color similar to the women of the Middle East today. Yet, each culture prefers to envision her as appearing like themselves. That’s not an insult or negation of her Jewish heritage. Rather, it helps to fulfill our yearning to be close to her and to recognize her as our very own mother. She knows that. 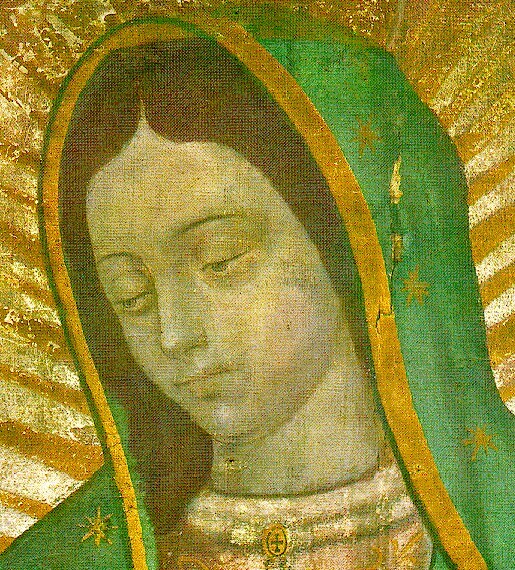 For example, when she appeared to Juan Diego in Mexico, she appeared to look just like a Mexican maiden. That wasn’t accidental, and it wasn’t Juan Diego’s imagination. We know it from the amazing image left on his tilma! It’s also interesting to me that she appeared differently in each of her apparitions. She adjusted her appearance each time, it seems, in order to best touch the heart of the person to whom she appeared or to most effectively convey the message she bore. A friend sent me the link to an article on ChurchPOP.com that shows 13 different depictions of Mary from various cultures. I have to admit, that some of them initially were quite surprising to me, given my caucasian-European background. But, when I put my own framework of thinking in regard to the Blessed Mother aside, I saw each one as absolutely beautiful! My heart was touched by the detail and the way in which each culture had made Mary their own. That’s because she IS their own. She is Mother to all, and so it’s rightful that all would wish to picture her as looking like themselves, with whatever features and skin color that entails. I hope you’ll spend some time appreciating them, meditating on them, and then deepening your own relationship with our Blessed Mother. “Know, know for sure, my dearest, littlest, and youngest son, that I am the perfect and ever Virgin Holy Mary, Mother of the God of truth through Whom everything lives, the Lord of all things near us, the Lord of heaven and earth. I want very much to have a little house built here for me, in which I will show Him, I will exalt Him and make Him manifest. I will give Him to the people in all my personal love, in my compassion, in my help, in my protection: because I am truly your merciful Mother, yours and all the people who live united in this land and of all the other people of different ancestries, my lovers, who love me, those who seek me, those who trust in me. Here I will hear their weeping, their complaints and heal all their sorrows, hardships and sufferings. What a wonderful meditation. I love the quote from Guadalupe. And when we think of our father’s call to become little Mary’s we can also grow closer to her by seeing her in all women, our mothers, our sisters, wives and daughters. Her image is all around us. Thank you Marge!